Singapore has been in the news because one of the Facebook billionaires has decided to re-domicile to that low-tax jurisdictions. Some American politicians reacted by blaming the victim and are urging tax policies that are disturbingly similar to those adopted by totalitarian regimes such as the Soviet Union and Nazi Germany. Maybe they should go on one of their fancy junkets instead and take a visit to Hong Kong and Singapore. Even with first-class airfare and 5-star hotels, taxpayers might wind up benefiting if lawmakers actually paid attention to the policies that enable these jurisdictions to grow so fast. They would learn (hopefully!) some of what was just reported in the Wall Street Journal. Facebook co-founder Eduardo Saverin’s recent decision to give up his U.S. citizenship in favor of long-term residence in Singapore has drawn fresh attention to the appeal of residing and investing in the wealthy city-state and other parts of Asia, where tax burdens are significantly lighter than in many Western countries. …Some 100 Americans opted out of U.S. citizenship in Singapore last year, almost double the 58 that did so in 2009, according to data from the U.S. Embassy in Singapore. …The increase of Americans choosing to renounce their citizenship comes amid heated tax debates in the U.S. Many businesses and high-income individuals are worried…[about]…tax increases in future years. It’s not just that America is moving in the wrong direction. That’s important, but it’s also noteworthy that some jurisdictions have good policy, and Hong Kong and Singapore are always at the top of those lists. The Asian financial hubs of Singapore and Hong Kong, on the other hand, have kept personal and corporate taxes among the lowest in the world to attract more foreign investment. Top individual income-tax rates are 20% in Singapore and 17% in Hong Kong, compared with 35% at the federal level in the U.S., according to an Ernst & Young report. The two Asian financial centers have also been praised by experts for having simpler taxation systems than the U.S. and other countries. …The tax codes are also more transparent so that many people don’t require a consultant or adviser. Keep in mind that Hong Kong and Singapore also avoid double taxation, so there’s nothing remotely close to the punitive tax laws that America has for interest, dividends, capital gains, and inheritances. One reason they have good tax policy is that the burden of government spending is relatively modest, usually less than 20 percent of economic output (maybe their politicians have heard of the Rahn Curve!). No wonder some Americans are shifting economic activity to these pro-growth jurisdictions. That last quote really irks me. I have a knee-jerk patriotic strain, so I want America to be special for reasons above and beyond my support for good economic policy. But the laws of economics do not share my sentimentality. So long as Hong Kong and Singapore have better policy, they will grow faster. To get an idea of what this means, let’s look at some historical data from 1950-2008 on per-capita GDP from Angus Maddison’s database. 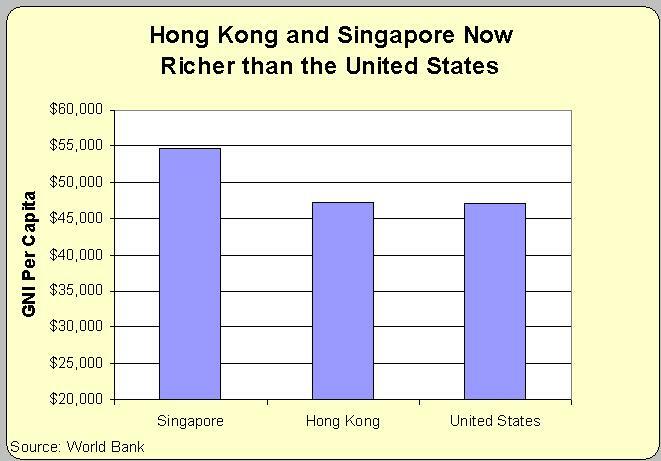 As you can see, Hong Kong and Singapore used to be quite poor compared to the United States. But free markets, small government, and low taxes have paid dividends and both jurisdictions erased the gap. Wow, America used to be 4 times richer, and that huge gap disappeared in just 60 years. But now let’s look at the most recent data from the World Bank, showing Gross National Income for 2010. It’s not the same data source, so the numbers aren’t directly comparable, but the 2010 data shows that the United States has now fallen behind both Hong Kong and Singapore. These charts should worry us. Not because it’s bad for Hong Kong and Singapore to become rich. That’s very good news. Instead, these charts are worrisome because trend lines are important. 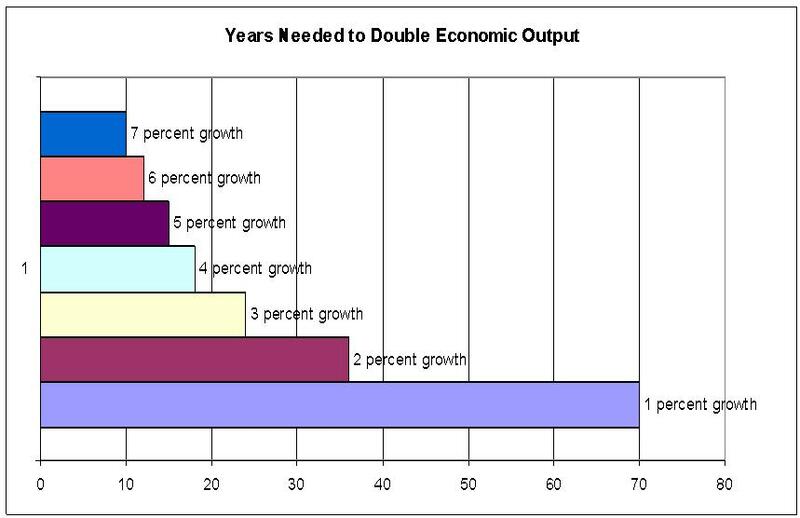 Here’s one final chart showing how long it takes for a nation to double economic output at varying growth rates. As you can see, it’s much better to be like Hong Kong and Singapore, which have been growing, on average, by more than 5 percent annually. 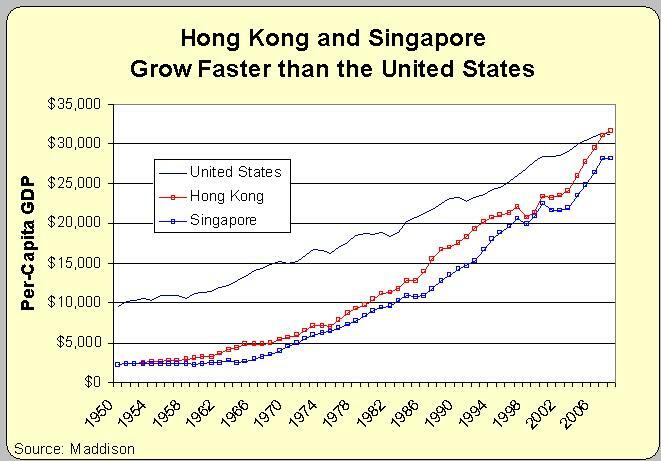 Unfortunately, the United States has not been growing as fast as Hong Kong and Singapore. Indeed, last year I shared some data from a Nobel Prize winner, which showed that America may have suffered a permanent loss in economic output because of the statist policies of Bush and Obama. What makes this so frustrating is that we know the policies that are needed to boost growth. But those reforms would mean less power for the political class, so we face an uphill battle. Just desire to say your article is as astounding. The clearness for your put up is simply cool and i can suppose you are a professional on this subject. Well along with your permission allow me to grab your feed to stay up to date with impending post. Thanks a million and please keep up the rewarding work. @Sluggh: I’m 80 and a Korean War vet. Sixty years ago both N. and S. Korea were completely destroyed. They’ve had rapid growth in the south, and look at the north. I doubt that tax rates in SK were identical to ours for all those 60 years. Capitalism enriches people…. Socialism impoverishes them. When you think about where most Americans came from and how their kin do in the places left behind, it’s not the brains but the lack of restraints and protection of property that allowed for the exceptional history of the place. And the leg up from being part of the British Empire and having its common law and then taking the hand off ca. 1950 didn’t hurt. There is a lesson though in the exceptional rise of HK and SG and to some extent SK and postwar Japan and Germany. Low tax an; low barriers to entry created much prosperity though a lot has changed since. Red China has been copying this but the way the state there treats its subjects is deplorable. You need permission to leave even for a short business trip; need I say more? There is some valid debate about whether the US Federal Gov’t remains a force for freedom. The folks inhabiting it have their own interests. Those interests are not necessarily ours. The way I see it, American exceptionalism consists primarily in the fact that the USA, together with Britain in times past, is the only great power in human history which has acted as a force for freedom. That some small countries have become, by some measures, more free than the USA, is not surprising, given how many countries there are in the world. If and when the USA stops being a force for freedom, that’s when we should be worried. Especially if no other country takes up the role. I think an important premise is being missed in the discussion about Eduardo Saverin especially as it relates to Hong Kong and Singapore. Ed is not skipping out on taxes, he’s paying them before realizing a gain, and there are enough tax strategies in the US that he can easily keep his taxes close to zero if he so chose. The real issue is that all his international accounts (since he presumably has more than a combined $10k in those accounts) will have to be reported to the IRS, those businesses will have to send in a report, as well, even if they are not US companies or do not have any business in America. The burden of compliance is costly and time consuming, yet that annoyance can be overcome. The real problem is the opportunity these laws provide to strong arm and intimidate citizens. There is no due process when it comes to the IRS. You are presumed guilty. The risk that poses to anyone conducting business with an American has had a profound impact on the way business is conducted in entrepots such as Hong Kong and Singapore. It’s almost to the point that Americans need not apply. Korea has roughly the same income and corporate tax rates as the U.S., and yet its growth over the past 60 years is unparalleled. So tax rates aren’t everything. While I entirely agree with your argument in general and with your central point, it’s misleading to compare average income levels in city-states with those of much larger countries. London’s GDP per head for example is way above that of the UK. Luxemburg’s GDP per head is higher than the UK’s, but not higher than London’s. I think someone wrote a book about certain rich folks taking a walk from the looters and takers,now who was that? SO, singapore is Galts Gulch,who knew? The BBC has recently compiled a list of the 60 most influential Britons during Queen Elizabeth II’s 60 year reign. Conspicuously absent – it is the BBC after all – is the name of Sir John Cowperthwaite, the government bureaucrat sent out to Hong Kong in 1945 to oversee its economy, who should probably be number one on the BBC’s list -even though nobody has ever heard of him. Who’s this Severin guy? Who is he to refuse to work for the people? Crucify him! Sure he gave us Facebook. But that’s not good enough, we also want half of his booty. He has proven highly capable of serving the people. He must remain here and do so. The only reason the policies are even on the table is that they are likely to garner significant, if not outright majoritarian support amongst the American population. And this does not bode well for America. This particular policy — renunciation of citizenship being the only avenue to not paying taxes to a now distant and thus largely irrelevant motherland, coupled with the obligation to pay special exit taxes in order to merely be given the opportunity to do so – is a gross aberration of policy to an otherwise still free country. And as I have perhaps said a few times before, these particular policies, more than anything else, point to the fact that the much touted American freedom is probably more a result of historical serendipity and historical momentum at this point, rather than rational thought. But momentum against fundamentals is very short lived and a sure preamble to an imminent vicious cycle of decline. By succumbing to this new expansion of pitchfork economics, the American people are launching even further into the vanguard of oppressing economic emigration. As Mr. Mitchell has also pointed out in some of his most relevant posts, worldwide taxation, renunciation of citizenship being the only option, AND recently exit taxes to boot, are a highly aberrant area of American policy. A policy that is highly at odds with a country known (and to a large extent is/was) the beacon of freedom, especially economic freedom. No other developed country has such an oppressive policy regarding economic emigration. Not only that, but the only two other countries that come to mind with similar pitchfork policies are North Korea and Eritrea. Prospective entrepreneurs take notice !! If you HOPE to invent wonderful things for the people and one day be rich, take note of the CHANGE. Be proactive and bail out BEFORE you become rich. Better yet, make your inventions and innovations overseas, as a foreigner, perhaps even with foreign capital. Yes, sure the “bail out” phenomenon is still a trickle, since America is still one of the more economically free places in the world – overall. But beware. There are many highly non-linear phenomena in economics where a trickle is the short warning to an uncontrollable flood. A flood that breaks out once a critical tipping point is reached. The sudden uptick in “economic defections” may be just another indication that the critical point of no-return , the loss of overall competitiveness leadership, is near for USS America. This is likely to be a policy that plays heavily into the declining days of the once grand and free New World empire and greatly accelerates entrance into the vicious vortex of decline. That is the cycle of Hope, Change, decline, Desperation, go back to more Hope and Change. By closing the exit safety valves, Americans are setting themselves up for an explosive end to their now declining empire. Having opted to start copying the statist and economically stagnant collectivism of Europe and now sliding into decline, Americans are now resorting to desperate measures. This is the final stage before the great slide. What is today an accelerating trickle will sooner or later turn into a proactive flood as America is very close to the threshold of losing its global leadership as a place to work hard, and get rewarded by keeping the fruits of your labor — and prosper. As is predictably typical of such situations the people will be very slow to react once the issue becomes a real problem. It will be virtually impossible for “the people” to quickly reverse the pitchfork policies they only recently supported so adamantly once rapid decline starts. That is the story of Greece. Once the decline starts, people will perhaps take feeble half measures in rolling back a small fraction of the suicidal policies, but alas, by then it will be too late, the pendulum will have already started swinging in the opposite direction and other competitive environments will be in fast ascent. The tide will be impossible to reverse. For now the American people seem poised not only to ignore the problem but to actually increase the pressure by adding even more emigration restrictions, like no other nation in the world. This desperation is typical of an empire that is reaching its end stages and is an attitude that predictably contributes to an explosive end, as opposed to an orderly decline. Soon, foreign entities, foreign nationals with foreign capital will be competing with American companies who are operating under en ever less enviable regulatory and economically oppressive environment. Once that starts happening (it is already happening) its game over for America. The once enviable American standard of living will unravel fast after a few iterations of the Hope and Change cycle. Once you slide into mediocrity you will realize how high you once were. By upping the pressure against fundamentals, Americans are hastening the arrival of this tipping point. I take issue with the notion that our losses are “permanent”. Any law or policy can be undone and its persistent effects with it. Eliminate the policies this year, and in 10 they will be long forgotten.